And leave the farm and kitchen cares behind us for a day. While we get out from under, and can slip off by ourself. Without a little query if the train would not be late. And after snortin’ once or twice, she started for the west. To make our pleasure perfect, she could make a finer day. And kept the trees and fences just a-jumpin’ in your eye. And got us to the cataract as advertised — on time. 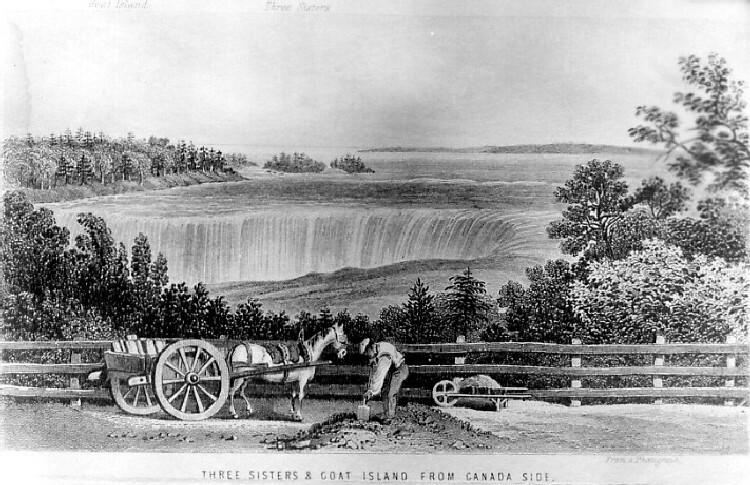 Till all of us stood face to face with old Niagara. And seein’ all the sights we could, and talkin’ “by-gones” o’er. The thought of any one so near this monster cataract ? By takin’ in a little of the sights of Niagara. Where we could keep on seein’ while we visited and eat. Is different from lookin’ at a live reality. And carry on forever thoughts of its immensity. While standin’ in the presence of the mighty things we saw. Convey the grandeur that was here to minds of other men ? This panorama, where so much of power and beauty blend. That makes a person shudder at the paucity of art. Who has the sensibilities of cultured heart and brain ? Who can not see, or hear His voice, in this immensity. We climbed upon a crest of rock, beside the foamin’ sheet. Almost entirely from view, enveloped in the spray. The wonder of all continents, and wonder of all years. Whose everlastin’ runnin’ doesn’t seem to run it dry. To form a sort of safety gauge, and let it’s surplus out. Without our knowin’ whence they come, or whither they will go. As pour down so incessantly over old Niagara. Which they have traveled over for so long, with noisy tread. And out of what He formed the rocks, and how He laid them so. And glorify His workmanship, because His structure stands. And after patient waitin’ she is sure to get it back. For there, if they could cross this stream, they might at last be free. When refugees from slavery, with blood-hounds on their track. And fling defiance, when they could, to tyrant master’s nod. To help the cause of liberty to spread throughout all lands. The chasm as we see it now, with edges fringed and torn. And climbin’ slowly toward the place it occupies today. It goes to join its comrades off in other seas or lands. And out of “the incline” we went, and down the steps we passed. That none but she herself can show how truly great she is. The breeze turned back toward us again, then how the water fell ! And didn’t relish gettin’ wet, as you may well suppose. To tell of all the grandeur of Niagara from below. Which looked as though it was composed of floatin’ dust of glass. And pulse and sparkle in the light with life and beauty so. A picture in my memory of this transcendent sight. And under whose momentum even solid mountains shook. On either side, but narrower than just below the falls. Nor livin’ thing, which has not fins, would dare attempt to go. These awful rapids, years ago, but ’twas the last of him. If such a feat they must repeat to blare abroad their name. When his success can neither bless mankind, nor honor Him. Of grave responsibilities, and room they occupied. A half a dollar each to ride the cable-chain railway. Charged just a dime, for down and back, with distance just as great. To sights which all men ought to see, instead of human greed ? And witness what the Lord is doin’, with uncovered head. To thrust itself before the world in such a place as this. But that, if they possessed the power, they’d fence it off to sell. No matter who goes up or down on re-adjustment day. Transportin’ passengers and freight across the boilin’ tide. And while our eyes gazed up at it we almost held our breath. Would make a moment afterward, as far as it would seem. For persons or for property which might be buried there. That He who moves before His eyes, might dwell within His heart. To perfect man and womanhood in spirit and in deed. And leave the wonders we had missed until we come again. And ’twasn’t long ’til Nancy Jane and I were home again. And weave its webb of romances about old Niagara. Their loudest, sweetest choruses in honor of their King. To stand where God has done his best, and all His glory see ? To make the place delightful, for His own eternal rest. Source: Allis, Almon Trask. Uncle Alvin at home and abroad. [Hornellsville, N.Y.] The author [The Times Association, printers], 1895.